One of the first games we do during our two-day ScrumMaster Workshops is our “Team Sling Game.” The game is a metaphor to experience and analyze social dynamics. It evolved from a KoKomm Workshop with Moritz Küffner (www.moritz-kueffner.de). 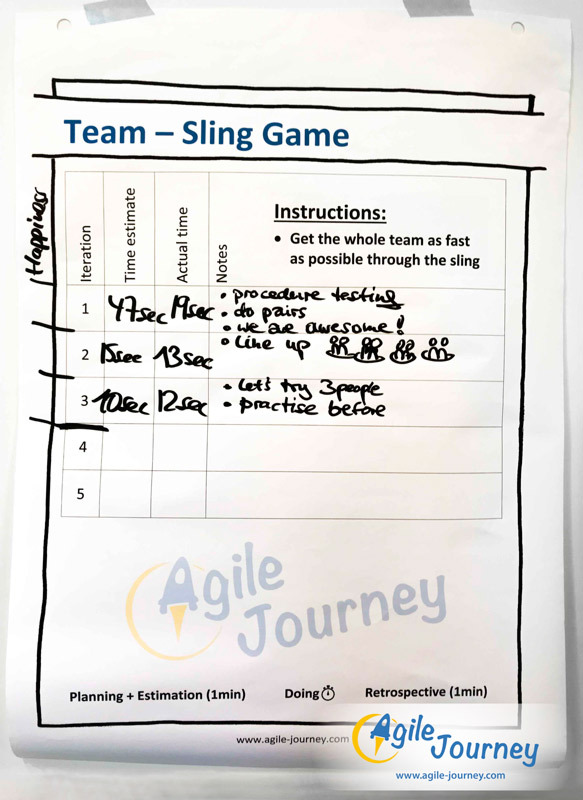 The goal of the game is rather simple: “Get the whole team as fast as possible through the sling.” The workshop group is asked to self-organize into equally sized teams of six to twelve people. 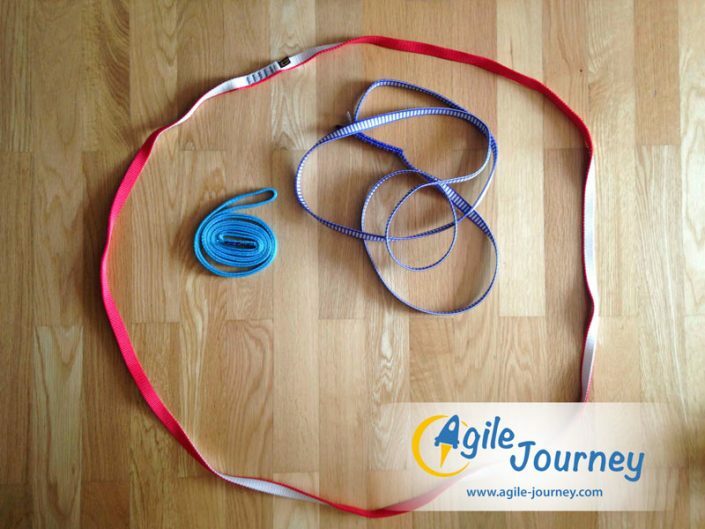 Each team receives a sling (a loop of flat rope used in climbing) which has a diameter of about 75 centimeter. The facilitator will guide the team through the game. The game will be performed in several iterations (1-5) with strict time boxes. Each iteration contains a Planning, Execution and Retrospective phase. The Planning phase (one minute timebox) results in a time estimate of how long it will take the whole team to get through the sling. The estimate from the team is recorded on a flipchart for tracking. During the execution phase all team members have to get through the sling.The facilitator records the actual time required by the team to get through the sling by stopwatch. After execution a Retrospective is held (one minute timebox), where optimizations for the next iteration are discussed. The game facilitator makes sure time boxes are honored and captures the estimates, actual times and some notes throughout the iterations on the flipchart for later discussion. Differences in how groups and teams function can be observed. 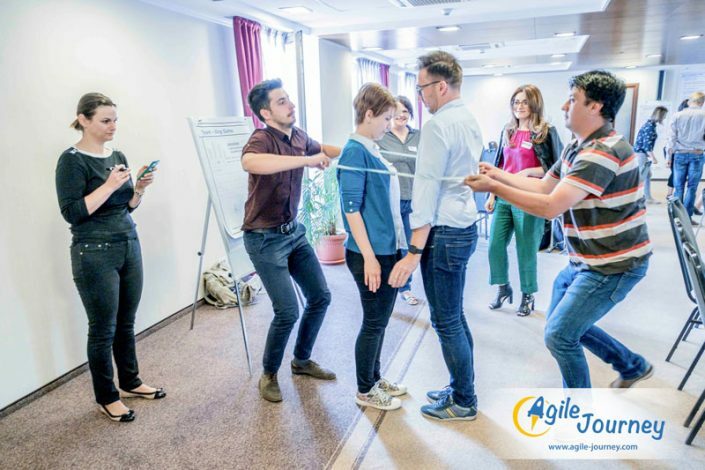 Learning from every iteration helps the teams to optimize their approach and evolve to a smarter outcome as well as getting better in estimating the needed time.